Handsewn slashes may look very neat, but all of us who have done it also know that it is a very time consuming sewing technique, and requires a great amount of patient when you slowly work your way through slash after slash. When doing commissions for others I’ve have therefore been working on different period solutions and alternative to keep the cost down for the costumer, and make my outfits available for a larger group. A technique very useful for light weight wool fabrics, velvet, brocade or other fabrics that fray easily. (read more about how I use the technique on wool here). 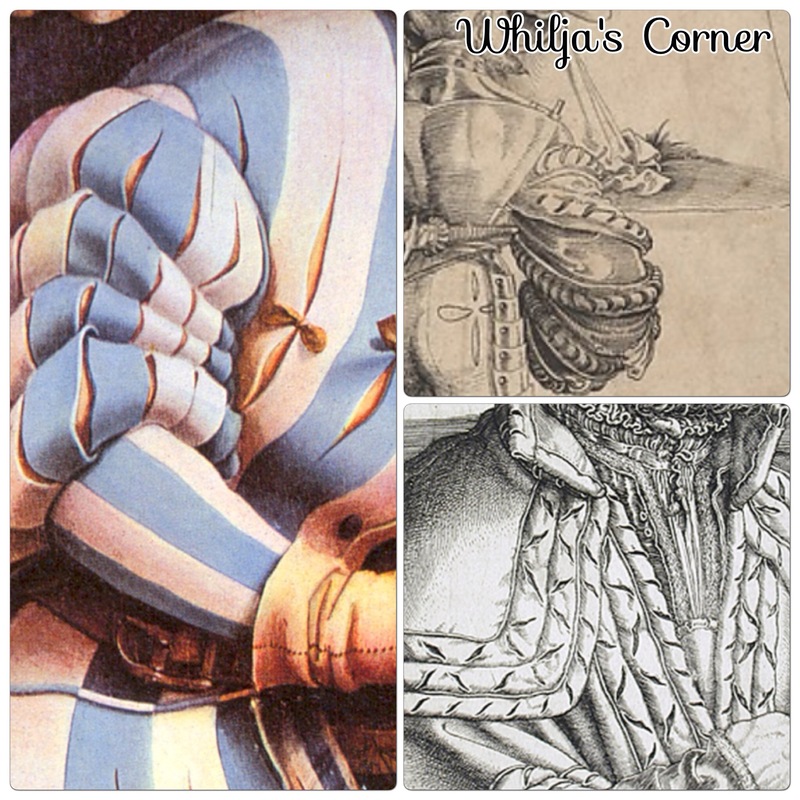 It’s most commonly seen on Saxon dresses. A) “Herodias” by Lucas Cranach the Elder, 1530. The slashes seems to be stitched to prevent the fabric from fraying. B) painting by Cranach. The shape of the slashes may inquire that it has been cut and the edges folded and stitched to the backside since brocade would be fraying to much to have just been cut open without any treatment. 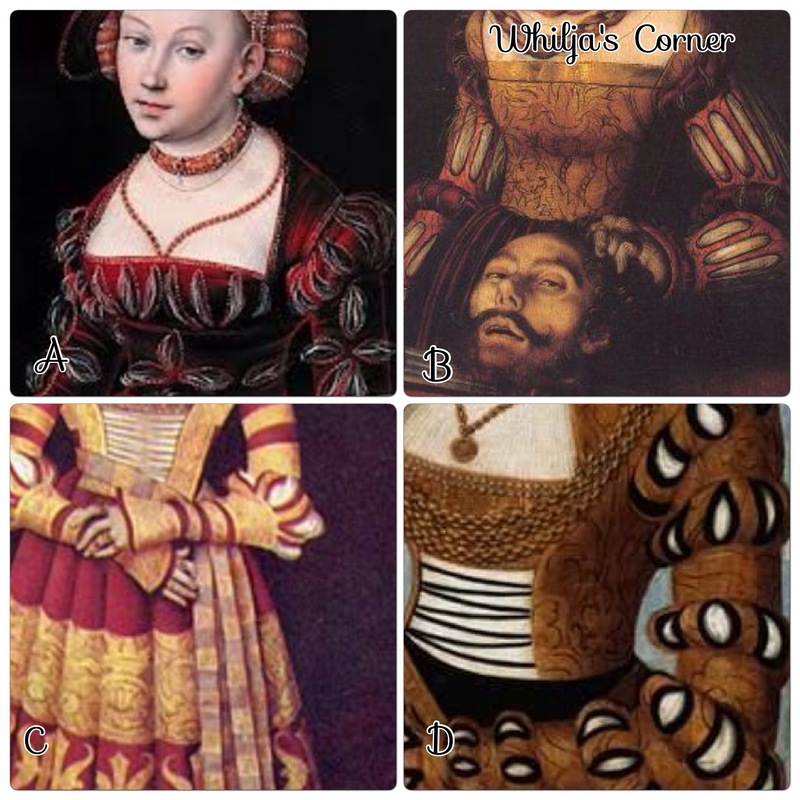 C & D) paintings by Cranach. 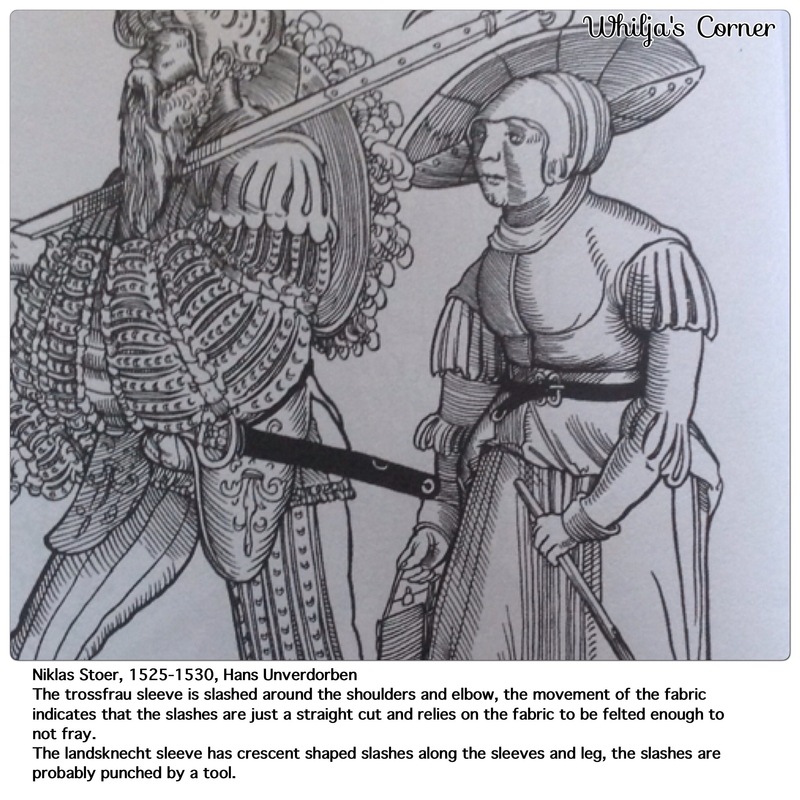 Another fabric can be seen along the outline of the fabric, indicated that each slash may be folded and the slashed seem is protected on the inside by lining with another larger piece of fabric, adding an extra decoration on the sleeve. A) Detail from Holbein’s Martyrdom of St. Sebastian. The detail shows a close up of the slashings and if you use a felted wool and slash it, the fabric would behave very similar to the painting. C) Aldegrever’s Portrait of Albrecht Von der Helle. A slashed decoration on a goller, which has probably a adding underneath the puff fabric to give a it a raised look as well as open up the slashing. Pinking tool has been found in England, and is basically a shaped sharp piece of metal which you punch a hole with. The shape of the hole is based on the shape of your tool. If you don’t have a pinking tool available in the right shape, cutting out the slash with a small scissors is also an option to achieve the right kind of slash. A) Jerkin, England, 1550-1600. Pinked decoration in shape of stars, diamonds and hearts. 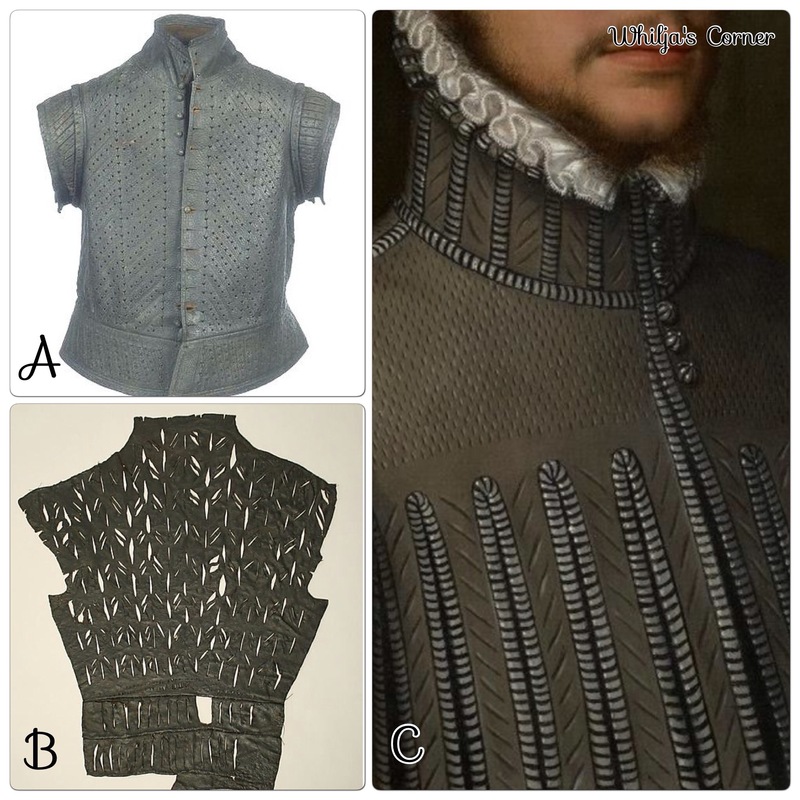 B) Doublet, England, 16th century. Cut slashes. C) Painting of a Nobleman, Monogrammist GR (Germany) c. 1555. Slashed leather with possible metal thread decoration around the edges. Which technique that is to be used may vary between where on the body of the garb I’m working on, what kind of material I’m using (light weight wool frays easier then felted wool, for example) and in some cases also on what type of status or trade the outfit is inspired from; a foot soldier or an officer or if they are a tailor or anything else. What kind of technique used can’t always be determine by studying a woodcut or a painting, there isn’t enough details to study or the artist may have not consider that detail being important or sometimes you just can’t see if the slashing is cut or punched by a tool. 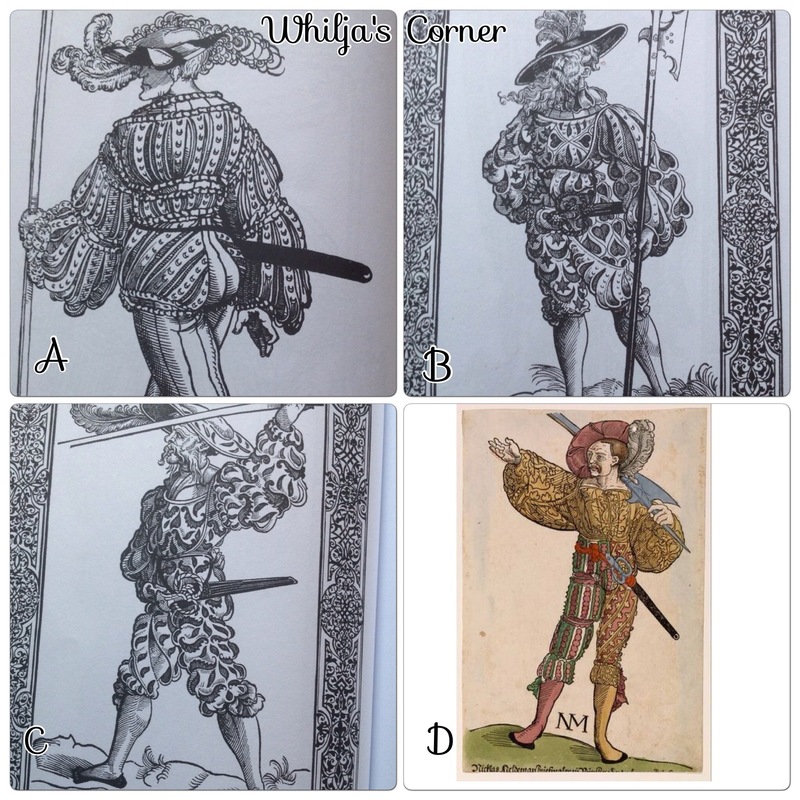 This entry was posted in Decoration and tagged Landsknecht, slashing and puffs. Do you have any idea what the Cranach painting is that you referenced in A? I cannot seem to find a title anywhere.